Mid-South Food Bank relies on thousands of volunteers to help provide millions of pounds of food to hungry neighbors. Hillshire Brothers employees volunteer to sort through canned food donations at the Food Bank warehouse. 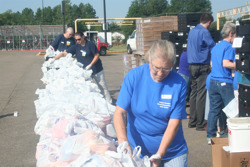 Walmart volunteers bag food for families during the Food Bank's Mobile Pantry in Union County, Miss. 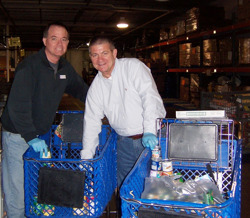 FedEx workers enjoy camaraderie while helping to sorting food donations. 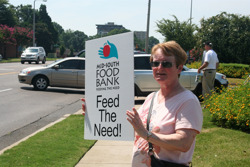 Volunteers helped encourage the public to stop by a food and funds drive for the Food Bank. 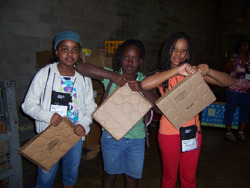 Some of the Food Bank's youngest volunteers from Lott Carey Mission. Volunteers as young as 10 are able to help, with adult chaparones. 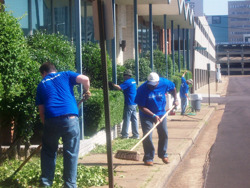 Medtronic employees volunteered to spruce up the outside of the Food Bank office. 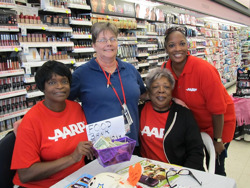 AARP and Walgreens employees collaborated on a Day of Service to collect contributions for the Food Bank. 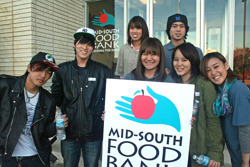 The desire to Feed the Need transcends language and oceans: Japanese exchange students from the University of Memphis volunteered during an afternoon at the Food Bank. 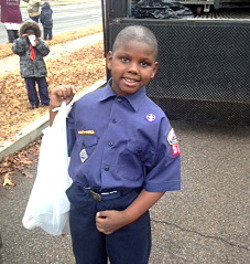 Local Boy Scouts and Cub Scouts at their annual Scouting for Food donation drive.